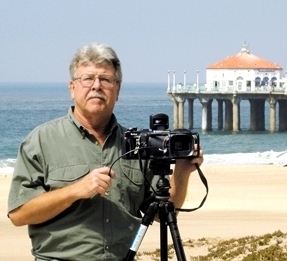 I am known for my South Bay and Manhattan Beach photographs. 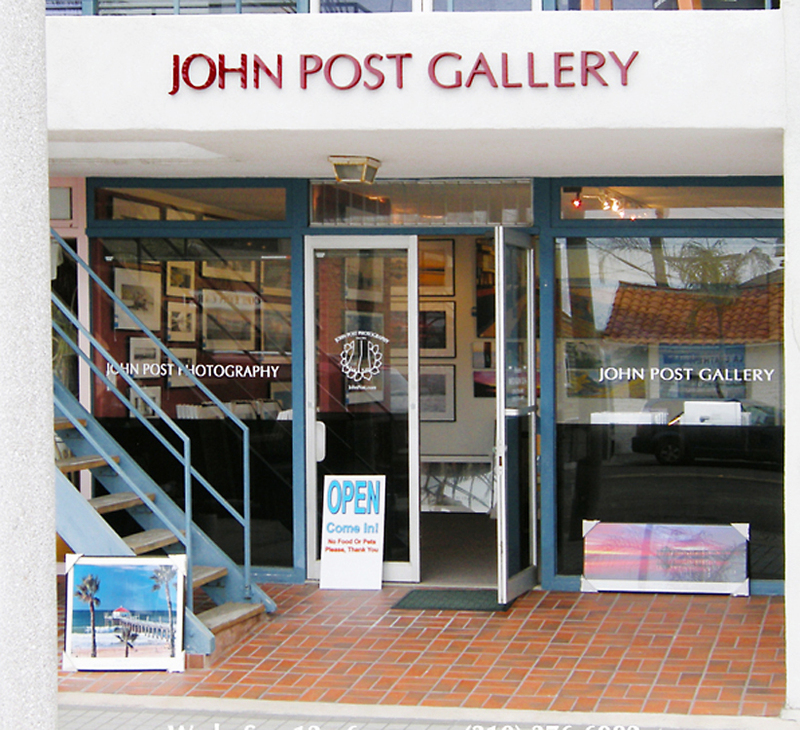 Many of my beach and pier photographs from the the last 40+ years now adorn the walls of your homes and offices. Throughout my career I have had the opportunity to travel the world photographing man and his environment. In this section, I highlight some of my favorite images and tell the story behind them. You can contact me directly if you have any questions about the images here, how to purchase a print of the image or if you have a request for a particular image of mine that you would like to see showcased. It was forty years ago this year and only a few months after I had vowed to myself to become a photographer that I shot this picture. I consider this image, ‘Still Life #1’, to be my first official photograph as a professional photographer. This was one of the first times that I could clearly and consciously make out that within the landscape I was looking at there was a uniqueness, some kind of ‘there, there’. Something in the scene I was looking at called out to me to take the time and look deeper into the scene, seek the optimum composition, a ‘point of perfection’ that would unravel the landscape and expose the feeling of active stillness in the boat and record ‘what was there’. At the time I was motorcycling around the island of Penang, Malaysia. A few weeks earlier I had purchased my new camera equipment and film in Singapore and was now on my mission to photograph my experiences in the world. Several times earlier in the week I had ridden past this part of the island coast where the fisherman would beach their craft in the late afternoon at low tide. The scene was interesting but not special. On this day I had Infrared Black and White film in one of my cameras. I had specifically been looking for scenes that would translate uniquely using the infrared film. That afternoon I was ‘seeing’ in infrared. The tropical afternoon was a hot and humid day on Penang Island. It had just finished raining and I was riding back to my lodging when I came around the bend. 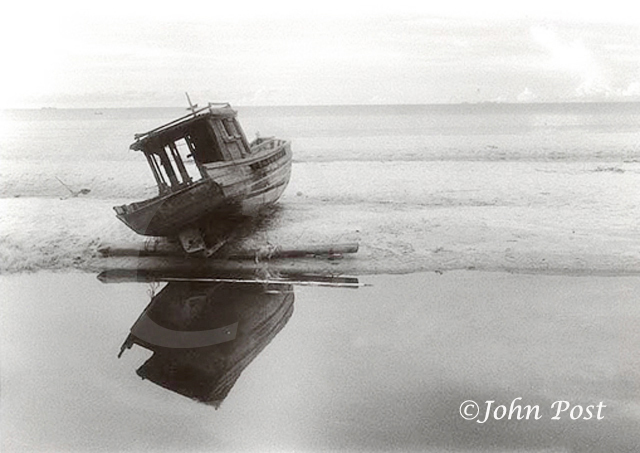 This time there was only one boat on the sandbar, the tide was way out and a totally still pool of water was behind the single boat. My ‘radar’ went up. I detected that this time the scene was different and that within the conditions I was looking at there was something special. I stopped. I felt the stillness of the moment, a time between activity and nothingness. Once tuned in, the scene virtually told me where to set my tripod. With a few minor movements to locate that ideal ‘point of perfection’ of composition I was ready. I took one shot and stopped. I then took a moment, stepped back and looked deeper into the scene for more; looking and waiting for the ultra perfect moment of ‘there, there’ in the boat, the beach, the water and the sky to fully reveal themselves. I shot two more photos, got on my Norton ‘Thumper’ and rode off. Since that moment 4o years ago, I have been on a continuous photographic quest to seek out the ‘There’, the ‘Point of Perfection’ , that ‘Decisive Moment’ that every subject holds within it. I have been shooting with Kodak Black and White Infrared film my entire photo career. After 70 years of production, in 2007 Kodak stopped making Black and White Infrared film.